When I was working, I would often get up early or save the workouts for the evenings, and guess what? Not much has changed since being home with the kids. But, there have been some times that I “try” to work out when Emmy, my toddler, is with me. That, my friends, is quite the sight to see. My main motivation to work out is for “me” time and for a stress/anxiety reliever. Having lil’ miss sitting on my back, head, or stomach is not exactly a stress-free work out environment. But, if I miss a morning workout or the evening is too crazy, I try and make an Emmy workout happen. We go outside and hit the pavement! 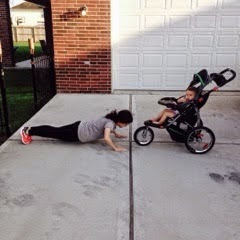 Here are some tips to make a workout happen with your little one! We usually go to a local park with a walking trail or cruise around the good ol' neighborhood. 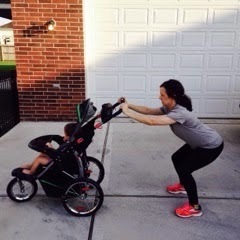 I aim for 30 minutes of workout time when Emmy is involved :) Find the best place for you! One nearby trail has a park/playground too so we frequent that one often! The playground is a nice reward for lil miss letting me exercise. 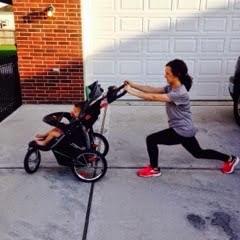 Look in your area to see if there is such a place for your toddler workout! You know your little one best! Close to nap or bedtime may not result in the most stress-free workout. Try after breakfast or maybe in the evening after dinner. If we go in the evening, we stay close to home and walk/run around the 'hood. I don’t have the best jogging stroller on the market. In fact, there may or may not be some duct tape patching up a few tire holes. But, hey, we make it happen. I make sure Em has her favorite drink and snacks as well play music she likes too (she’s a Bruno fan - sister can sing some Uptown Funk). We start with a 5 minute brisk walk. After the 5 minutes is up, I stop and do the following exercises - one set at at time (example: after the first 5 minutes of walking, stop and do 10 push-ups; after another 5 minutes of walking/running, stop and do 10 lunges, and so on for the squats and dips). You can walk and/or run for your 5 minute bursts of cardio - whatever you feel like you can handle! Repeat until your walk/run is over or your child demands freedom (with Emmy, it's usually 30 minutes. She is not a fan of being confined)! 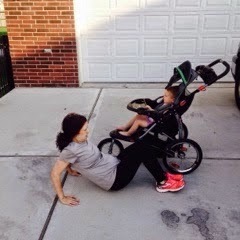 And there you have it - a strong workout with the babe. I do prefer to be alone while working out, but sometimes life and babies happen. You just have to make it work! And I promise you will feel so much better after you move - your family will thank you for it! Stay tuned...I'll share what I do when it's too HOT to hit the road!